Ypsilanti City Council voted to eliminate route five service from the Ann Arbor Transportation Authority Tuesday night to save money on costs. Sep. 9, 2009 · 8:24 a.m.
Ypsilanti City Council voted to eliminate the Ann Arbor Transportation Authority’s bus route five in the city Tuesday night. The move, along with scaling back hours for two routes and pledging to put bus funding in front of voters, was part of an effort to curb a $123,000 shortfall in the amount the city will be charged for its AATA purchase of service agreement. City Council approved the resolution, which was proposed by Councilmember Peter Murdock, D-Ward 3, in a 5-1 vote during a strategic budget session. Mayor Paul Schreiber voted against the resolution. 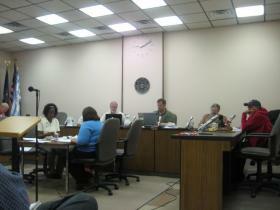 Mayor Pro Tem Trudy Swanson, D-Ward 1, was absent from the meeting. Aside from eliminating route five, which would have the route stop east-bound on Packard Road before reaching Hewitt Road, the resolution also called to cut one hour of service at the end of the day for routes 10 and 11. Route five would likely move north up Golfside Drive to St. Joseph Hospital and Washtenaw Community College. Routes 10 and 11 would stop running at 9:30 p.m. instead of 10:30 p.m. This would save the city approximately $64,000 in their purchase of service agreement. City Council learned in May AATA would be raising its cost for purchase of service agreements with municipalities in October, when the organization starts its fiscal year, to reflect administration costs along with fuel and direct costs. Council had decided to pay the full purchase of service agreement cost during this fiscal year, which was budgeted for $159,000. The new all-inclusive cost is set at $264,000. In addition, AATA will be raising the price 10 percent every year for the next three years to raise the price 30 percent total. The resolution also calls to extend the rates for the upcoming purchase of service agreement by 21 months. To make up for the rest of the funds, the resolution asks the AATA to utilize $101,000 of its federal stimulus dollars. Staff from AATA at the meeting said the organization expects $6.4 million in federal aid, 10 percent of which can be used for operational costs. Ypsilanti would thus receive nearly 16 percent of the stimulus funding allowed to be spent on such costs. For Ypsilanti’s part, the resolution calls to set aside $218,000 of next year’s budget for its busing costs. Additionally, if the discussed plan for a county-wide bus millage were to fall through than the city would put a proposal in front of voters to capture Headlee Rollback dollars strictly for busing costs in the Nov. 2010 general election. The AATA has said it plans to conduct a survey among county residents this month to see if the proposed regional millage is feasible. Michael Ford, CEO for AATA, said he will bring the information for board discussion soon. He said a decision will likely occur no later than September 23. He said the organization will then seek public input and educate the community, finally making the route change in May 2010. Schreiber said he voted against the resolution because he was against cutting bus service in the city. He said it sends the wrong message to other municipalities that Ypsilanti may want to pass a county-wide millage. Murdock said the resolution gives Ypsilanti some time to help work out a more viable plan to maintain adequate bus service in the city. Several audience members expressed their disapproval of decision at the meeting. “Won’t the people be surprised tomorrow,” said John Gawlas, a former Ward 2 councilmember. Calling the decision disappointing, Gawlas said the vote came about too quickly and the public had not been well informed about the possibility that a bus route through the city might be eliminated. Before the vote, Schreiber had said he wanted to postpone the decision to gauge the opinion of other municipalities that would be affected by the change and members of the community. Councilmember Lois Richardson, D-Ward 1, said she agreed, but voted yes after visibly toying with the idea.